Anti-Corruption Commission Director Kayukwa: I think before we get into anything now, I wish to say that we could still talk to you in the absence of all other people. But then all the rights are yours. You tell us what you would like to give. I wish to start with Mr. Lubinda. M’membe (chips in): Colonel, I’m Fred M’membe. We’ve never met. I’m the man in charge of The Post. I am responsible for everything that is published in the newspaper. I think before we get into anything, I want to put it on record that I’m very disappointed with your conduct. I was attending a workshop at the judiciary today to do with computerisation. When I went for lunch at the office, I found a letter from yourself requesting us to come here at 16:00 hours. I had to abandon the programme. The notice was very short. I don’t think that’s the right way to call other people on matters that are so serious. While I was still digesting that letter which you sent to us, we received a press release from yourself informing the press that you have called us. I find this seriously lacking seriousness and it’s serious lack of respect for other people. If you want us to work with you and cooperate with you, this is not the way you do it. If you wanted us to be paraded before the press to deal with this issue, you can do so and not disguise it. I think you are not interested in serious investigation of this issue. You are not the first organisation to invite us. Last week Friday, we were invited by justice Irene Mambilima at ECZ Electoral Commission of Zambia. A team of four people including our legal counsel went there. Nobody knows that such a meeting took place. We were discussing this issue with them. All the commissioners were there. The entire top management of ECZ was there. We had a very fruitful off the record discussion, which we have not even published; nobody knows that we went to ECZ. But before we could even come here, you put a press release. What do you want to discuss with us? Col Kayukwa: Have you finished? M’membe: No, I haven’t finished. This behaviour is not befitting of such an important position at ACC; it’s not befitting! You know even the thing that you are calling us for, you know. You have more information on this issue. And don’t try to hoodwink the public, you know! You are behaving in an extremely reckless manner. And don’t involve us in wrong things. We don’t do wrong things. If you have decided to cover up this issue, cover it up on your own. Don’t involve us. You are behaving in the most reckless way for a citizen of your position. You are leading a very important organisation in the country. And this is not the way to lead such an important organisation. If you have called us here to come and tell you our sources, you could have done it better. Mr. Kayukwa, this is not the way to lead. Anyway, you are Colonel Kayukwa. I shouldn’t withdraw that from you, you earned that rank and it’s an important rank as well. Sorry to call you Mister. You are Colonel. M’membe: No, I’m not finished. We sent you a press query; first you were phoned yourself directly about this issue. You asked for a press query. Col Kayukwa: Ok, Mr. M’membe. I’ve not asked you to… Can we now deal with issues here? M’membe: I didn’t bring myself here, listen to me. And that’s the behaviour that I’m talking about, that’s not becoming of a leader. You should listen. M’membe: We sent you a press query. If you don’t want me to help you, tell me I can go. I didn’t come here on my own, listen. You called me to come and listen to me, I’m talking. Col Kayukwa: I had asked Mr. Lubinda to talk. M’membe: I’m talking, you called me, I didn’t come here on my own, you sent me a letter. If you don’t want me, I can go. M’membe: I’m telling you, I’ve come here because you invited me. Col Kayukwa: Are you not the one who cut in when I was speaking? M’membe: I’ve the right to speak as well. Col Kayukwa: I would like to speak with Mr. Lubinda. M’membe: No, I haven’t finished, just listen. Col Kayukwa: Did I finish when I was speaking? Col Kayukwa: It’s not that I’ve… just listen to me. Col Kayukwa: Why don’t you want to listen to me? M’membe: If you don’t want me I can go. M’membe: Don’t waste our time here. You called us on an issue which you know. M’membe: No, you called us. No we shouldn’t waste each other’s time. If people want to cover up, they should just cover up other than trying to involve other people on issues that you know. We’ve never involved ourselves in criminal activities. Nchito: I think I kept quiet because I was not invited to speak. Lt Col Kayukwa: That’s why I asked, do they want to be with counsel or what? You know I was setting the stage for the next point and I started with Mr. Lubinda here so that he can say what he wants to do so that we can proceed. Nchito: Maybe let me give a preamble on my dealing with some of those issues. I am in an uncomfortable position in that I am in my other home. I spent a lot of time amongst my ACC colleagues. I worked with them. If I thought that these people The Post and Lubinda were suspects, it would be slightly difficult to come just now. So, in answer to your question, I’m here as counsel, not because they are suspects, but because they wanted me to be here. Lubinda: I wish to respond to the question that you raised Colonel. Yes, you invited me here in my personal and private capacity. But when I got news that actually this meeting is open to the press, I realised it’s open for the public. And because we are dealing with this issue in this manner, and giving it the seriousness I thought that we are giving it, I decided that I will not come alone, I’ll come with others. And that’s how come I asked counsel Mutembo if he could come with me. And that’s how I also invited a colleague of mine at the far end of the table Charles Banda to join me. And coincidentally, you also invited The Post to come at exactly the same time, 16:00 hours. And there is no beating about the bush, it is me who has been issuing those statements through The Post. And actually when I was invited, I also called them and said ‘look I’ve been invited’. And by the way, Mr. M’membe says he got the invitation when he came home office for lunch. I got the invitation an hour before the time that’s scheduled for this meeting. And I had to ask counsel, ‘what am I going to say?’ They haven’t even given me time to go and dress up like them. I’m going now like a soldier. And he said to me ‘let’s go, I’ll come with you’. So to answer your question you were expecting me to come alone. I couldn’t come alone on the basis that, number one, this meeting is open to the press, it’s open to the public. I would like that whatever I say is not only reserved to you but is also captured by others; the press and also my colleague at the end there. It’s very nice that you invited both myself and the newspaper that has been the courier of my message; that has been kind enough to publish what I’ve said. The others haven’t been able to write what I’ve been saying. But The Post has been willing to do that, and I thought that you shouldn’t ask me questions in their absence. So, it was good that you actually invited both of us at the same time. That’s the reason for this big group. Kayukwa: Okay. So, I think it’s not the first time I’m in a situation like this because when a person who is not an accused wants counsel to be there it’s okay; it’s your right. Now, Mr M’membe? Because I’ll tell you that the issue was that you Lubinda were going to discuss with him, Eddie Sakala, ACC chief investigator here. 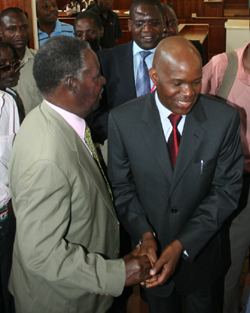 And Mr M’membe was going to discuss with Mr Soko there. So what is your choice? Kayukwa: I’ve said the choices here… I’ve assigned two officers here to attend to the matter. So what is your choice? M’membe: I don’t have much to tell them. Whoever, you can bring one, you can bring half, you can bring 10, 20, I will tell them that you know. You yourself Colonel Kayukwa you know the truth about this issue of UPG. You know the truth and you want to lie to the whole country that you don’t know; you know the truth. You are the one they should be interviewing. It’s you they should interview, not me. M’membe: Because whoever you are giving me to talk to me, I’m telling you, whoever among yourselves, your leader here knows the truth about this UPG thing. He’s sitting on it for reasons best known to him. And this behaviour I find very irresponsible. He knows more than I know. So, interview him, he will tell you and then you can inform the people. Kayukwa: Mr Lubinda we proceed like that? Because from what I hear, he can talk to whoever I’ve appointed. That’s what I’ve understood. And he would like everybody here to be around. M’membe: Including yourself because I want to tell them that you yourself you know the truth about this UPG thing. And you are sitting on it, trying to deceive people that you don’t know. Kayukwa: Mr. Nchito, we proceed? Nchito: Really, this is your..
M’membe: You’ll just plunge this country into chaos. Lubinda: They said they have two options, that Mr M’membe on behalf of The Post is interviewed by one, and that I am interviewed by the other. My position is that I have been quoted in The Post. And if there are going to be any questions, those questions shall be raised to me and the couriers of my information. I see no reason whatsoever justifying the separation of the two. So I would like that if you are going to interview us, you will interview me and the ones who have been publishing what I’ve been saying. And if everybody from your side will be here, that makes it better. Nchito: I think we’ve discussed a little bit of what the sentiments are. Maybe it would be helpful to hear from your side. You called these people. Maybe you just give a preamble of what your expectations are, and then it will be much easier to move from that basis. I don’t know if that becomes okay, then it’s easier for one to advise. Kayukwa: Like what I said, there are no suspects. The interview of a witness you are aware of the procedure. It is a straightforward procedure. There is no preamble. They will be asked questions and things like that. Nchito: No, I think the problem, sir, that we have, and please understand me as I am speaking only the mind of your witnesses, or your potential witnesses. They are saying to you that they believe, this is what I’m hearing and those are my instructions to an extent. They believe that you know about this matter and you are covering up the corruption of UPG. So they are saying ‘what is it that you really want from us? Because the information that you already have you are covering up’. So I think that in all the heat, maybe we can try and get some light. That is the point that I’m making. M’membe: Mr Nchito, if I may cut in you. I will ask Colonel Kayukwa to look me in the eyes and tell me the truth that he doesn’t know anything about UPG. Look me in the eyes. Lt Col Kayukwa: There’s a procedure we are following here. I think I’m doing the interview, I wished you had invited me to come. Eddie, can we start? I think, like you said, we shouldn’t waste each other’s time. So, maybe can you please Eddie as we said you can discuss Lt Col tries to leave the conference room. M’membe: No, I would like you to be here. I don’t want to talk about you behind your back. I want you to be here so that I don’t give your officers a burden to tell you something negative about yourself. I want you to be here, I don’t want to give these officers… They are your juniors. I don’t want to give them a burden. I want to say things in front of you because I sincerely believe you are covering up. And these things will catch up with you one day. These things will catch up with you. Eddie Sakala: I think the issue is the one which is in the press, and I think it has been mentioned. The issue is, there’s an inquiry here, I think that was confirmed by the statement that we issued. But of course from some of the things which you have been carrying out, you get a suggestion that there has been new information. So following that is there any other information that you have which you can give us who are investigating the matter? Is there any other information which you may have or share with us on the case at hand? Nchito: Can I just consult? Nchito: Mr Sakala, me I like being there (points to the next room) Lt Col Kayukwa: You know the place for reasons known to yourself. M’membe’s team leaves the conference room to consult among themselves. Nchito: Thank you very much DG director general for giving us the opportunity to visit with you, and also to consult over preliminary points that have been raised. Both clients in that sense have asked me to respond to the issue that you have raised before. I also think that it is better so that we can keep emotions in check and just deal with the issue on the table. Both parties would like to further raise their concern that it appears that the Commission is not telling the public the truth because according to them you now say there’s an inquiry. It is an investigation around the issues that they have been raising and yet you told the public that there is nothing. That in itself raises serious concerns for our clients. That’s what Mr M’membe is saying, and I think the same position is shared by Honourable Lubinda, is that the Commission knows that this company is engaged in acts of corruption, bribery and by those acts in money laundering. And it is wrong for the Commission to conceal that fact in the manner that you did in your statement by stating that there’s no investigation concerning ECZ or any supplier to ECZ. I think that is really the bone of contention, and it is not for us or rather for the clients to start supplying you with the evidence because they firmly believe that you know this fact. And maybe we can discuss around that issue, if there’s any need for discussion. The reason that becomes a serious issue is that, and I think Honourable Lubinda has written to you and written to the Commission indicating that the character of the company printing ballots is an important issue which has ramifications for the peace and stability of our country after the election. Now, given that the Anti Corruption Commission has not been entirely honest on this issue. I think a serious problem has been created and I don’t know how you are going to sort it out. And I don’t know if my clients can help you to resolve that issue. Kayukwa: You still want to consult? Kayukwa: Would you like to go to that place? M’membe: No, no, no it’s a short consultation. M’membe and Nchito confer for a short while. Nchito: I think that I was going round in circles trying a bit to be diplomatic. but my client insists that I must put it the way it is. I think what they are saying is, they don’t believe that the Commission is honest. And it serves no purpose to deal with a dishonest Commission; you have been dishonest on this fact. And you could not and should not have said that. In your opinion, UPG is clean but my clients are saying they are not. Kayukwa: Mr Nchito, as you said, maybe there is need to discuss and all that. I think the letters are quite clear, the issues that we would like your clients to help us with are quite clear. It is quite clear that they seem to have more information. In my statement, I issued that statement. I never denied that there was nothing going on. Nchito: Can we have a copy of the statement? Kayukwa: It was through the press. In fact, I almost rang you to say, is this what you said? Because I know Mr Lubinda here has been to my office and when I read that later on when the other articles came up, I found that those words were attributed to you. My statement is very straightforward; we are not saying we are not doing anything now. What I would like your clients, maybe to help us with, is if they have information they should help us. All those because what we said is that we have an allegation. Now for you to come here to say can you give us what you have, we are the investigation wing, we are investigating. And I would like to be helped by your clients. Nchito: DG, maybe I think I also owe you a duty, as a professional junior as I might be, to tell you exactly what the statement is. And I requested the gentleman there to, I am sure it shouldn’t be difficult to get a copy of the statement that was issued from your office. Kayukwa: Mr Nchito, what I am saying here is, certain things have been said. I am asking your clients to help. And I am asking them to help, where is the evidence for me to go further? But if they don’t have evidence because we seem to be saying I have the evidence. If they don’t have it, they should just say so. Nchito: No, no, no, DG. I don’t think we are understanding each other. I would really be grateful because I think this matter is serious, you might give yourself an opportunity to correct. If people have misunderstood your statement, it might be better to .., you might get an opportunity to correct. So what I wanted to do is to tell you that this is what your statement said. My clients are saying this is a lie. So that maybe we can address that; and you know how we deal with witnesses, you want to bring them to a level where they can trust you if the witness is saying ‘you Bwana are telling lies and I don’t trust you, I don’t think I should even be dealing with you’. So we are trying to build that confidence, and I am simply saying for me the starting point is the statement. It’s not about a complaint. They sent you a query, when the statement was issued it wasn’t even sent to them. I don’t know whether you know the circulation list. It did not include them. Kayukwa: Yes, what I’m saying here is that I am dealing with an investigation. Your clients seem to have information, that’s all I am asking for. So if they don’t have the information they should say they don’t have it. M’membe: Mr Nchito maybe let me just chip in. The DG is repeating for the second time that if we don’t have information we should just say so. If we don’t have; he has repeated this twice. To me the purpose of calling us here is for the DG to prove that we actually don’t have that information so that the lie that ACC has told on UPG can be sustained. That’s what he wants us to say, and that’s why he is consistently repeating it. Kayukwa: Mr Nchito let’s make progress. M’membe: We are here to be used to clear UPG, not to investigate UPG, no. Nchito: Can I say something that will help us to make progress? Is it possible to get the press statement? Sam Mujuda: There is a request for the letter. Nchito: The press statement, I’m just asking for it, can I have it? And I want to demonstrate from your statement what the problem is. Then from there you can reassure them, and then we move. Kayukwa: So, who has gone to print it? Nchito: I think the two gentlemen were waiting for a signal. Nchito: They were looking at you to indicate. Kayukwa: So maybe as we wait for them, okay the press statement came afterwards, isn’t it? Kayukwa: I have understood you that maybe it could have misled people; for which I appreciate that because when we write and then maybe what you think is going there is misunderstood. I appreciate that point so that, let them bring it and then we can discuss. Lubinda: Maybe they can also bring a copy of your statement advising me not to drug you into politics; that I dragged the Commission into my political issues. Kayukwa: But I never issued a statement to that effect. Lubinda: No, but it was in the press. Kayukwa: But there are so many statements in the press. That’s why I even asked for written statements, even when my phone rings I answer it. And this is why I think when you are saying let’s bring that, that’s why I said I appreciate that so that when issues come up and you ring me and I talk to you and you go and say something I can’t say I never spoke to Mr Lubinda. Lubinda: But I’m trying to illustrate to you the reason why I take the stand that I do on this matter, that when I’m saying things about issues that I believe you know about, you have been quoted in the press as having said he Lubinda is just politicking. He just wants to drag the Anti-Corruption Commission into his politics. That puts me in a very awkward position. Kayukwa: That one I can tell you that I never said it, here. M’membe: But Mr Lubinda, this is the most political the ACC has ever been in its history. And probably the worst the ACC has ever been throughout its history, from its formation. These gentlemen have destroyed this organisation, such a wonderful undertaking by our people destroyed by greed, selfishness and mediocrity. This is an important institution. But this is the worst ACC has been. For 20 years, I’ve dealt with this organisation, I can say this is the worst I have ever seen ACC where the leadership of ACC has been politically compromised. Kayukwa: But you are bringing politics here? M’membe: There’s politics brought here. Kayukwa: We don’t want to be bringing complaints over issues that are not for this institution. M’membe: I have to be frank with you. I will tell you today and I’ll tell you after. And this will be shown that you have destroyed this institution. And history will record this, you won’t wipe out this. You have allowed politicians to control this institution and run it down. You have run this institution down; an important institution. What we have said in our editorial comments, we can say it in your face. You have destroyed this important institution of our people by allowing yourself to be controlled by people who gave you the job. You have destroyed this ACC. It will take a long time to rebuild public confidence in this institution. This is not the institution I’ve been dealing with for 20 years. You are a public officer, I will talk to you. Kayukwa: Yes, that’s why I even answer my phone. Excuse me, I answer the phones. M’membe: Go ahead and answer. Lt Col Kayukwa goes out to answer the phone. M’membe: Mr Eddie Sakala, some of us have dealt with this institution for 20 years, from 1991 to 2011, mwaononga you have destroyed the Commission. This is not what it was. It had its weaknesses like all other institutions but this is the worst ACC has ever been. And this man of yours has destroyed this institution by taking instructions from politicians. You are no longer investigating crime in this country, no. You have destroyed our people’s credible institution. It’s gone, ACC is gone! It will take a lot of effort to build it. You people built it and you have allowed it to be destroyed by mediocrity. It’s not everybody who has destroyed this organisation, it’s this man Kayukwa. You have allowed him to destroy it. This UPG thing, he knows it. It’s in his office, he knows it. You know it has taken a long time to build this organisation but it doesn’t take long, seconds to destroy it. You will not retire out of this place with pride which you deserve. I worked with you Mr Sakala, we have done a lot of things together here as a citizen; and I was proud of this organisation. You remember I came to report to you about justice Matthew Ngulube’s corruption? I came to report to you personally. The man had to resign, there was no malice, Ngulube was my friend. I used to go to Ngulube’s house. That was the ACC I knew, and that’s the ACC I worked with; the ACC I reported on and about. Not today’s ACC of Colonel Kayukwa, no. He has destroyed this organisation. That’s why I want him to be here. I don’t want to speak behind his back, he has destroyed it, where you want to protect criminals instead of fighting crime. UPG are criminals. You are now trying to find a way to launder them. And you want us to come here to tell you our sources? It won’t happen. Even if God came here, I would say ‘God take my head off’. It won’t happen! I’ve been in this job for 20 years. I was a young boy, you didn’t have grey hair, when we started working together you didn’t have grey hair. Today you have grey hair and me I have grey hair. Ncito yatisiliza. Yaa, I’m not a small boy ba Sakala. I’m 20 years older than when I started this job. I’m not excited about these things, we have done bigger things. We made a lot of mistakes, learning. Today we have more experience. We can’t do things like kids to see the work we have done for 20 years just destroyed. Institutions were built, we contributed to the building of the credibility of ACC. It pains me. I’m sorry to say this. I will say it, even if you put me on top of this building. I will say what I’m saying because I contributed to the building of ACC. Over the last 20 years my work has been dedicated to building the anti-corruption fight. I’ve contributed to building the image of the ACC. To see it destroyed like that by selfishness, it pains me. The same way with DEC Drug Enforcement Commission; these two organisations have gone. Nobody respects these organisations anymore. If anybody tells you that you have got credibility in the eyes of the people, they are cheating you. You are gone. Even us, we don’t count you as a partner now in fighting corruption. We are not. And what you don’t know is that you have destroyed a lot of other institutions in the process. Lt Col Kayukwa comes back with his statement and gives a copy to Nchito. Nchito: Colonel, I think that where the problem has arisen is the first sentence in the second paragraph. ‘The ACC wishes to state that there is no investigation concerning ECZ or any of its suppliers’. My clients are saying that this statement was made in the context of a categorical statement having been made that UPG, to your knowledge, has been engaged in corruption, bribery and by those acts of money laundering. And you issued a statement where you are saying ‘there’s no supplier of ECZ who is connected’. In fact, to use your words, ‘there’s no investigation concerning the ECZ or any of its suppliers’. And the implication of that statement is that you don’t know any of the issues that Mr Lubinda has been raising in relation to UPG. And what my clients are saying is that, Colonel, that is not true because you know. I think that’s what Mr M’membe has been saying. And their concern is that you as ACC should be interested that an organisation that has been connected to criminal enterprise should not be allowed to be involved in an important exercise such as printing ballot papers because the necessary implication is that what else are they doing? So by putting that information into the public, the ECZ will claim, they will hide behind your back now and say, ‘but the director general of ACC told us there’s nothing like that’. Mr. Lubinda has gone so far as to give you a bank account and challenged you to say ‘please confirm that you have not investigated this account in relation to UPG. Mr Lubinda has, I think, been waiting for the response. There has been no response. Lubinda: The response in the press has been that I am being political and I am dragging the ACC into my politics. Nchito: So, I think that is where you have that crisis of confidence, so that even if somebody had information, how would they give it to you? And also the other problem that you have caused is that when you call people to come and give evidence, obviously they have been speaking in public. But if you are carrying out serious investigations, the whole world needs not know that you are now carrying out, or that you have called these people to come and give you the information. Assuming it’s a serious investigation, and my clients feel that this is an exercise meant to further launder UPG. They believe that the ACC is being used to launder criminals. That’s the problem that you have. Kayukwa: So are they saying that they will not give information or they have no information? Which is which? Nchito: They have information, they are concerned that you have lied, Sir, and you’ve lost the trust of the people. Kayukwa: So they will not give it to me? Kayukwa: But to somebody else? M’membe: Not to you. If somebody else tomorrow takes your place, we will deal with that person. You have lost our trust. You have lost credibility and we don’t believe that you should be here. We sincerely don’t believe that you should be here, Sir. In our view, you are not fit to head this organisation; you are aiding criminals. Kayukwa: I think you mentioned that, I took note and I also looked at that, that it wasn’t distributed. I think you made that point. Is there anything else you wish to say? Anything? Mr Nchito? Kayukwa: Thank you very much. May I have my press statement back!